Have you noticed the amount of musical artists that have added San Antonio as a stop on their United States tours? Or noticed the increase in concerts you can now attend in your own city? If you haven’t, you’ve clearly been living under a rock because San Antonio’s music scene has been growing faster than the speed of sound. Local music goers predict that San Antonio will be the next Austin or San Francisco within the next five years. How incredible. If you don’t believe this to be true, there are plenty of events to prove the possibility of San Antonio becoming the next big city in music. Let’s start with the Aztec Theatre. The Aztec Theatre has been apart of San Antonio’s history for almost a century. At 91 years old this year, the Aztec has hosted a variety of events, but it has never been a successful music venue. August of last year, Live Nation- the biggest ticketing company in the United States- bought the Aztec Theatre. Live Nation also owns all 13 House of Blues around the country, so it’s safe to say that San Antonio now has its own form of the famous venue. 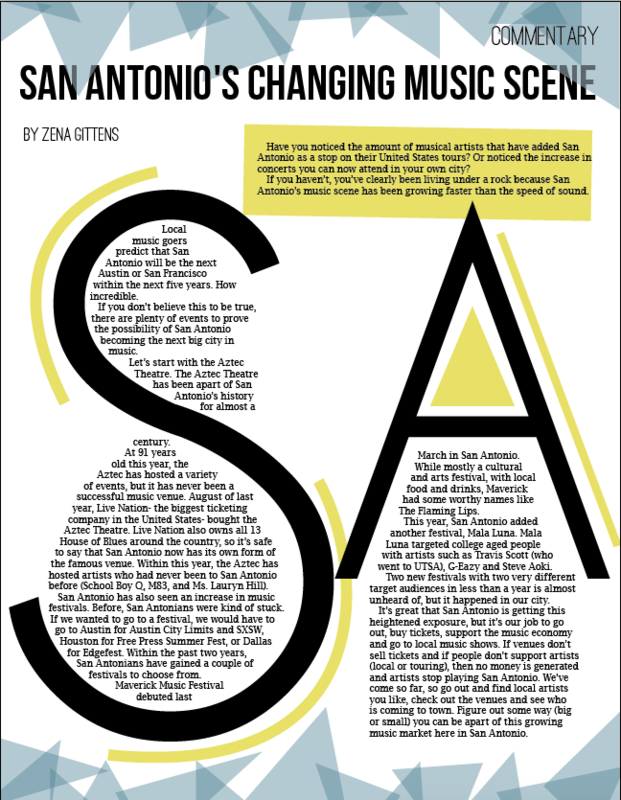 Within this year, the Aztec has hosted artists who had never been to San Antonio before (School Boy Q, M83, and Ms. Lauryn Hill). San Antonio has also seen an increase in music festivals. Before, San Antonians were kind of stuck. If we wanted to go to a festival, we would have to go to Austin for Austin City Limits and SXSW, Houston for Free Press Summer Fest, or Dallas for Edgefest. Within the past two years, San Antonians have gained a couple of festivals to choose from. Maverick Music Festival debuted last March in San Antonio. While mostly a cultural and arts festival, with local food and drinks, Maverick had some worthy names like The Flaming Lips. This year, San Antonio added another festival, Mala Luna. Mala Luna targeted college aged people with artists such as Travis Scott (who went to UTSA), G-Eazy and Steve Aoki. Two new festivals with two very different target audiences in less than a year is almost unheard of, but it happened in our city. It’s great that San Antonio is getting this heightened exposure, but it’s our job to go out, buy tickets, support the music economy and go to local music shows. If venues don’t sell tickets and if people don’t support artists (local or touring), then no money is generated and artists stop playing San Antonio. We’ve come so far, so go out and find local artists you like, check out the venues and see who is coming to town. Figure out some way (big or small) you can be apart of this growing music market here in San Antonio.